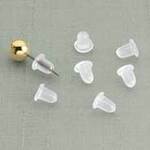 Clear bullet earring backs are soft, flexible and easier to use than regular backs. Lightweight, comfortable and ideal for sensitive skin. Clear earring backs design makes them practically invisible on post-style earrings. 12 pieces. Each 1/4"L.